What I enjoy most about late season (December) running events – is that they don’t get started until mid-morning. From March thru November in the Mid-Atlantic region – running events begin at the wee hours of the AM. Forget about having breakfast, coffee, stretching, or having a few moments of zen — you need to rush out the door and join with masses of humans – with pixie dust still in your eyes. 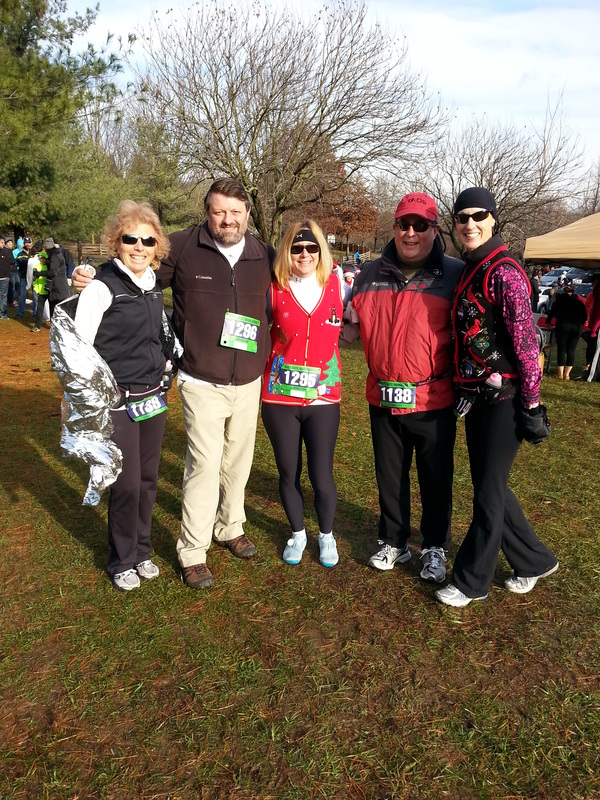 The Jingle Bell Run – a 5K charity run/walk event held in Ellicott City in early December – starts at 9:30AM. It’s practically lunch time for us type A early birds. We have completed 2 full body sets on the foam roller, and we’re at least 2 inches taller from all of that stretching. Working on a 3rd cup of coffee, we parked on residential side streets to avoid crowded parking lots – and joined with our team of runners and walkers inside of Centennial Park. Runners included Team Femme — Emma, Jill, Deb & Jane, and the Walkers included Team Manly-Man – Chuck, Mike, Owen, Paddy — and puppy Lulu. I also want to mention, that Team Femme – included the oldest runner on the course. More on that. With approximately 2000 entrants of runners, joggers, strollers & walkers – it was obvious by the number of baby strollers, small children and dogs on leashes – that there would be mayhem at the start. Rather than try to run around these course obstacles, Team Femme opted to start at the front of the pack. While this offered the advantage of not having to navigate around walkers and dogs — we were running much faster than ‘conversation pace’. By the first mile, I was breathing hard, and Emma was busy chatting with me as if we were not even moving. Jill was focused on breathing with a damaged lung, and elder Deb was passing those half her age. More on that. Just before the 2 mile mark, we reached a hill. It had to be an 18% grade – and my pace slowed to a crawl. Whiskey Tango? Where did this hill come from? Fortunately, the remaining course was not filled with more of these summit surprises – and despite the distance being “only” a 5K – I was thrilled to reach the finish line. Out of breath, gasping for oxygen, one by one Team Femme crossed the finish line – only seconds apart. And this included the oldest women on the course. Keep reading. Within 5 minutes – the memory of gasping for breath was long gone. Team Femme decided to return to the course. Apparently we needed more running. The plan was to run in the opposite direction of the event – and catch up with Team Manly-Man — join with our spouse walkers, and walk back to the finish, together. We met up with our significant others at approximately the 2 mile mark. Paddy was moving as fast as his legs would allow, Lulu couldn’t run fast enough, Mike skillfully managed Lulu through the maze of walkers, Chuck had overheated with too many layers, and Owen hadn’t broken a sweat. At this moment, Type A Team Femme discovered that running is overrated – and it was delightful chillin’ with the walkers. Not more than 20 yards from Team Manly Man’s finish, we heard our elder Team Femme member – called to the podium. Deb, as it turns out – WON the 70 and over ladies event – AND was the oldest person on the course at the young age of 99. Of course, Deb – is not 99. She is not close to 99, and she looks like a youngsta if you ask me. But apparently if you fail to list your date of birth on your event application — your age defaults to 99. Who knew? As Deb briefly styled for a photo shoot as the oldest person on the course — she promptly returned the 70&Over Medal — to it’s rightful owner. Someone who actually was 70. Don’t you worry Deb — someday that 70&Over Medal will be rightfully yours!